Info: Created on 4th March 2018 . Last edited on 17th March 2018. I think the space character could be a tick wider. Still uncontent with that dot over i, j etc cetera, ! and ? keep appearing in my nightmares as well... But the good news is that the Greek & Cyrillic charsets are so close that you can touch some of 'em! I am open to any critique and suggestions (especially the dot over i, j...). Make the dots over the i and j (and the period and comma and quote) diamonds just a squinch smaller, and offset them slightly. Okay, so Cyrillic--Russian, Serbian, Macedonian, Ukrainian, Belarusian--letters are finished for now. @RubyRedPanda, can't believe my eyes--you're here now, too. I noticed what you mean, I'm trying to fix that right now. Seems that the broken block has spread all over the Cyrillic letters with tails--and the sample was affected as well. The tails should be okay now. I can't figure out how the Greek number sign works. Are they put on a letter (so I should make its width equal to zero)? • I would also change the tail of Q, maybe have it extend down from the left bottom? 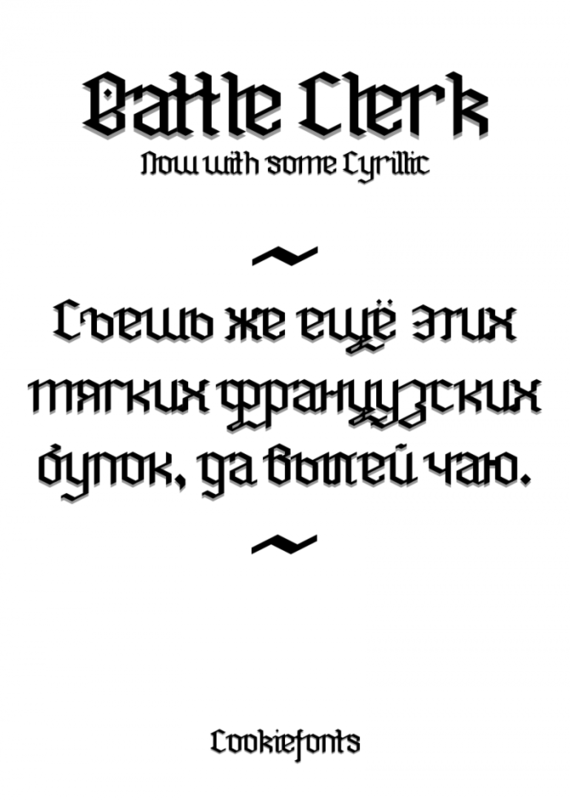 Food for thought: Cyrillic is evolving, and I, while designing my typeface Dehuti (Font Squirrel/Smart Fonts), which is undergoing yet another major transformation, always wondered why half of the lowercase letters were simply small capitals? Apparently, this discussion has been going on in Bulgaria since the 60's, which is why they decided to see how their lowercse would/might have evolved in the same way that Latin did; thus, the newer forms of the letters, many of which are identical to Latin. Eventually the model for the Cyrillic alphabet will evolve into these newer forms, instead of having alternative designs for specific languages. Also, A, D, and G, in Greek and Cyrillic, should all be triangular, or mirror A.
Congratulations! FontStruct Staff have deemed your FontStruction worthy of special mention. “Battle Clerk” is now a Top Pick. WOW! Just WOW! I didn't even expect my font to become a Top Pick. Thank you, thank you very very much, @meek. Thank you for such a great tool to help me make my dreams come true. Also, now that I completed 291 glyph, I feel like the font should move from the old, temporary name Battle Clerk (some might have noticed that it's an anagram from Blackletter) to a new one. All I can think of is something like Gothica. Have you got any suggestions? @marcomorahuizar, I think I will :) Glad that you like the font, I put much time and effort in it. Yeah, I like the alternative J. :) And the new Q—absolutely love it. Your lowercase psi still needs an ascender, and would look better wider, like phi. Lowercase Cyrillic ef and zhe still need ascenders, i.e., mirror the ascenders in Latin, h, l, k, et cetera. Upsilon (lowercase) shouldn't have the foot, i.e., It should look more like nu. P.S. ḷ, ṃ, ṇ, and ọ, are in Latin Extended Additional. As far as names . . . Gothica is already taken. You could play around with more anagrams—create something totally alien. I do appreciate your help very much, thank you. @NoahRabbani, I don't think I got it, can you explain your comment? the most important differences is that sharp s (ß) doesn't have descender. beta is obsite, it needs the descender to show the different. @Wataru Aiso, Thanks to @TCWhite it's much better now! P.S. You forgot to add ọ, which is also in Latin Extended Additional. Of course, if you feel like getting around to it, you could add the remainder of the Vietnamese characters, which ọ is a part of. P.P.S. You also forgot to add the lowercase ij. A beautiful style and well-planned glyphs that look good in all variations/sets; I like the script feel of it. 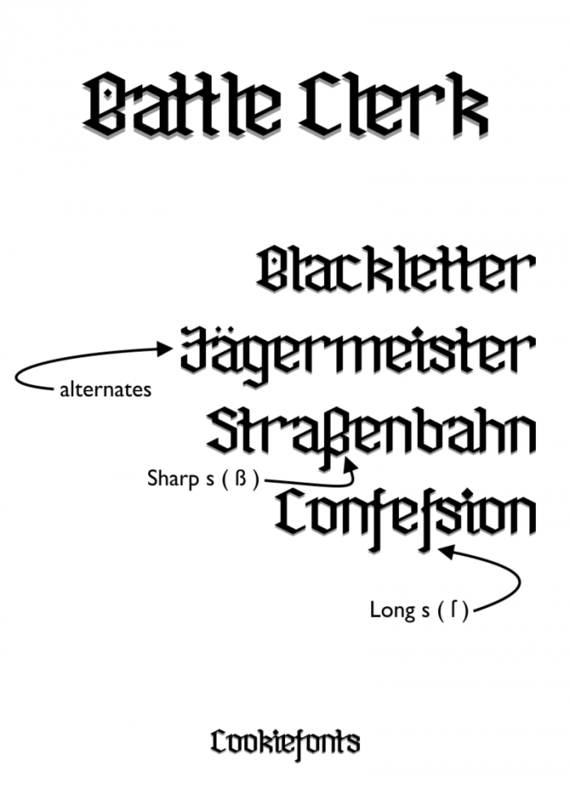 A Blackletter font written with a modern broadnib *smile*.